they flew in on wednesday, so piper and i went to welcome them home. it was so good to see them and hard to believe it's been 6 months since they left for their big west coast adventure. this makes me think of a michael jackson song, can you guess? joseph introduced piper to the blackeyed peas--her new fave. thursday piper and i went to hear the "baby noise." everything seems good. she's a little over 4 pounds and i'm getting extremely uncomfortable, which has to be a good sign. ha. after that, we met up with the boys and miss k for lunch at proof. amazing. seriously, if you live around here: go to proof! we sat outside and it was pretty hot, but the food made up for it. later, we went back to the pool to cool off and spent the rest of the evening together. mr. arganbright joined us for dinner and it felt just like old times. friday we met up for pizza from noah's (the best), birthday cake from the bake shoppe, and drinks & music at the vaudeville mews. my drink was water. in case you were wondering. :sigh: this picture makes me happysad. i miss them already. 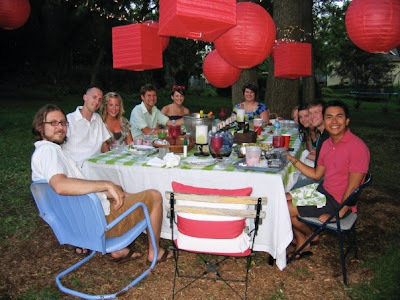 it was a shabby-chic potluck with fantastic food, perfect ambiance, and some of our dearest friends. the mismatched chairs and linens looked so cute! some of the home-made goodies included fresh spring rolls, apricot-glazed pork, hot california rolls, and asian noodle salad. oh, and i heard the sangria was great. we had such a fun weekend, but it flew by and now they're flying back to san diego. FUN, FUN, FUN weekend! I'm sad it's over. :( Lovely post though. Was I intensionally doing that deer-in-the-headlights look?! I look insane or something.